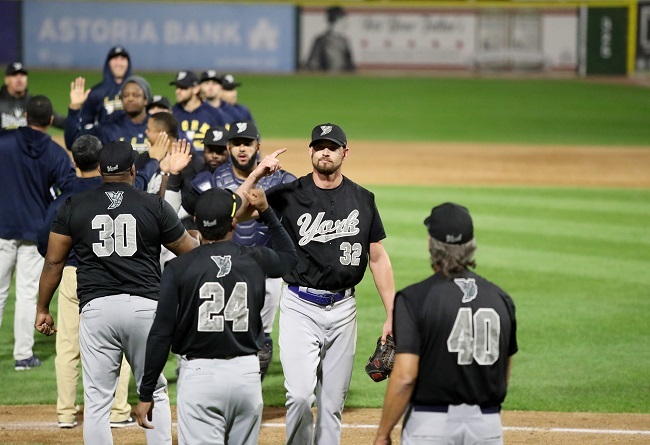 (York, Pa., Sept. 28, 2017) - The York Revolution won another thriller, 5-4 in Game Two of the Atlantic League Championship Series on Thursday evening at Bethpage Ballpark, taking a 2-0 lead in the best-of-five series. The Revs return home to PeoplesBank Park on Friday at 6:30 p.m. for Game Three, sitting one win shy of their third Atlantic League championship. In similar fashion to their Game One victory, the Revs twice took a lead in the late innings, with closer Chase Huchingson closing out one-run victories with five-out saves both nights. York jumped in front as Alonzo Harris jacked a two-strike leadoff home run to left in the top of the first, spotting the Revs an immediate 1-0 lead. It was his fifth game-opening leadoff home run of the season. Ducks starter Jake Fisher settled in after the home run, retiring 12 consecutive batters and allowing nothing else through the first four innings. The Ducks answered in the bottom of the first as Elmer Reyes reached on a one-out single and scored on a throwing error to tie the game at 1-1. Lew Ford advanced to third base on the error, but Revs starter Frank Gailey struck out the side to prevent any further damage, also settling in until the middle innings. Long Island grabbed a 2-1 lead in the fourth as Alex Burg lined an opposite field solo home run down the right field line. The Revs drew even with a run in the sixth. Ryan Dent and Chase Simpson set the table with singles to put runners at the corners, and Harris skied a sac fly to center, bringing Dent home to tie it at 2-2. York edged ahead in the seventh as Isaias Tejeda drove a double to right-center with two outs, and scored on a single to center field by Travis Witherspoon for a 3-2 lead. Long Island immediately threatened in their half of the seventh, loading the bases on a hit by pitch, walk, and bunt single by Delta Cleary, Jr. Gailey rebounded to strike out Anthony Vega, and right hander Grant Sides entered to strike out Dan Lyons. Giovanny Alfonzo managed to tie the game on a two-out infield single, but Sides struck out Reyes to leave the bases loaded. The Revs went right back in front with two runs in the eighth. Simpson led things off with a base hit to left and advanced to second on a ground out. Jared Mitchell pulled an RBI single through the right side to bring Simpson home with the go-ahead run. Mitchell moved to second on the throw, and advanced to third as Rubi Silva drag bunted for a base hit. Telvin Nash tapped an RBI ground out to third, scoring Mitchell to give York a 5-3 lead. Brad Allen retired Ford on a ground out to begin the bottom of the eighth, but a walk to Marc Krauss and single by pinch-hitter Angelo Songco put runners at first and third. Huchingson entered to face Burg and nearly had a one-pitch double play on a grounder to short, but a low throw to first slipped out of the glove of Nash, who quickly recovered as Burg ran through the bag. Initially ruled out, the play was overturned allowing a run to score. Cleary, Jr. followed with a walk to push the tying run to second, but Huchingson retired Vega on a fielder’s choice at short to keep the lead intact. Huchingson issued just a two-out walk to Reyes in the ninth, striking out Ford swinging to secure the victory. Sides (3-0) picked up his second win in as many nights, and becomes the first pitcher in Revs history to total three wins in a postseason. Huchingson becomes the first to total three saves, as each broke records previously held by R.J. Rodriguez. Gailey was strong in a no-decision, limiting the Ducks to three runs (two earned) on five hits in 6.1 innings, walking one and striking out six. York righty Victor Mateo will face Long Island right hander John Brownell in Game Three on Friday at 6:30 p.m. as the Revs go for the third championship in franchise history and first since 2011. It is “Black Magic” night as fans are encouraged to dress for a blackout, and the first 1,500 fans will receive black Revolution T-shirts presented by WellSpan Health, emulating the black alternate jerseys the Revs have worn throughout the postseason. The first 1,500 fans also receive a Revolution rally towel sponsored by Penn State York. Tickets are on sale at YorkRevolution.com, (717) 801-HITS, and in-person at the Apple Chevrolet Ticket Office.